Listen Ahead is first encountered through traffic signage whereby the audience begins to imagine, conceptualize and anticipate a space for listening. 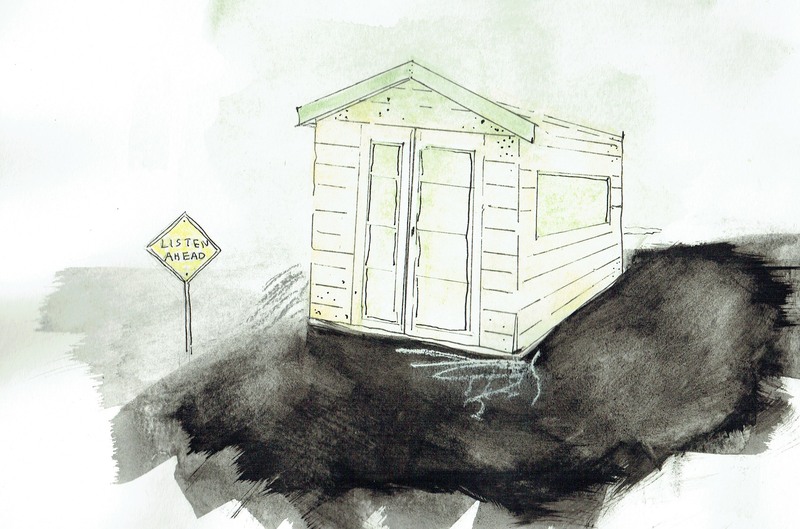 “Ear Hut,” is a structure that privileges the sense of listening over sight – there are ear-level openings in the walls allowing sounds from the outside environment to the inside. A fluidity of the interior/exterior carry meaning beyond the walls, and can be contemplated upon as the listeners rest on benches. These natural exterior sounds combine with the evocative sounds inside the hut to create a unique sound composition and experience specific to the Caramoor. there are ear-level openings in the walls allowing sounds from the outside environment to the inside. A fluidity of the interior/exterior carry meaning beyond the walls, and can be contemplated upon as the listeners rest on benches. These natural exterior sounds combine with the evocative sounds inside the hut to create a unique sound composition and experience specific to the Caramoor.